Ronald was born on June 3, 1964. 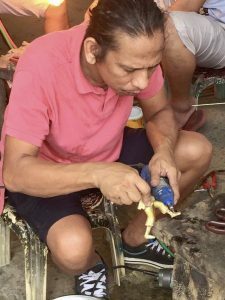 His parents, Aurea and Amado Castrillo – a great writer, Illustrator and sculptor has influence and inspired him to develop his interest and skills in the arts at a tender age. He finished a degree in Bachelor of Science in Aeronautical Engineering Major in Aircraft Aircraft design at PATTS School of Aeronautics. His inspiration are his surroundings using metal, wood and glass element to form lines and curves that people can touch and feel.